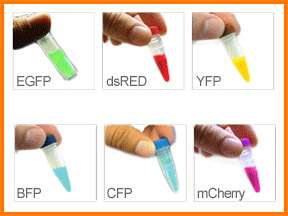 Fluorescent Proteins Products | BioVision, Inc. The intricate and complex dynamics within a cell and in a cell population can be captured in real time using fluorescent proteins (FP). Fluorescent proteins (e.g., EGFP) have become well established marker for gene expression and protein targeting in intact cells and organisms. This temporal and spatial resolution helps in detailed understanding of various pathways and events related to biochemical functioning in living cells. Almost all endogenous proteins of interest can be fused to FPs and its variants and this has numerous applications in life sciences that include protein interaction, FP tagging of specific proteins and their trafficking within cells, following fate of specific protein populations within a cell, paracrine interactions, and in-depth understanding of signal transduction pathways in real-time. Fluorescence proteins are also very useful in gene expression and many other applications including: use as standards for SDS-PAGE, Western blot analysis, fluorometer and flow cytometer calibration, fluorescence microscopy, and microinjection into cells and tissues, etc. Antibodies against these proteins and mammalian expression vectors, as well as GFP quantification kit area also available.